I voluntarily reviewed an ARC of this book and I bought it. Because anything by Carly Phillips is a keeper. Great story. I couldn't stop reading. Austin, had been burnt by an ex who deliberately tricked him into marriage by getting pregnant. Then she wanted out because she said she wasn't meant to be a mother so she settled for cash, as many times as he would give it to her, threatening to take him to court to sue for custody (you know she didn't want it).Austin was worried she could convince a judge though. He swore he was done with marriage and relationships. Then he kinda fell for his daughter's nanny Mia. She believed he wanted only casual. As attracted as she was to him, she realized she couldn't do casual. Now what? Would Austin ever realize the deeper feelings he had for Mia? Before he lost her? Someone was after Mia! The ex? Her old boss? Loved this story. 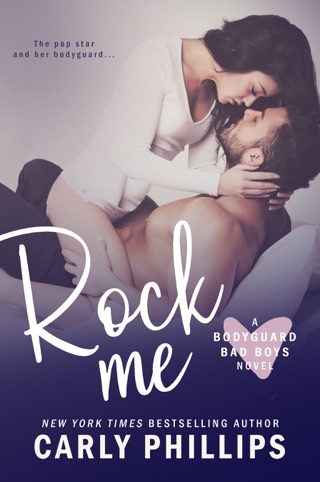 Tempt Me is book 2 in the Bodyguard Bad Boys series. I loved this book!! This is Austin Rhodes and Mia Atwood's story. Austin works for Alpha Security and Mia is the live in nanny for his daughter Bailey. Austin was severely burned by his ex-wife and isn't looking for anything. Mia lost both her parents at a young age, lived in foster care until she was went to college and is looking for her HEA. When the past comes up to bite them both, they turn to each other for comfort. As I said I loved this book. The characters were very enjoyable, there was great chemistry between them, and I really enjoyed the storyline. Austin is an alpha male, with a high risk job and loves and dotes on his daughter-- he also has sole custody of his daughter. Mia is a strong intelligent woman, that is always positive and thinks of and takes care of others before herself. I really liked them together as a couple. There were some nice twists in the storyline that I enjoyed. Don't continue reading unless you want some of the story given away. One thing that I really was hoping to read at the end which the author didn't do was talk about when Austin and Mia told Bailey and his parents that they were pregnant. I don't know why I felt like this was something important, but to me it was. Just my opinion. Can't wait for the next book in the series!! Hope this helps! Happy Reading!!! second chance love story centered around a great single dad! !